We recently participated in the Sheraton Grand Sacramento 10th anniversary celebration and created a room filled with vintage Italian charm for the celebration. As one of the hotel’s preferred vendors, we were invited to showcase some of the amazing weddings and special events we have planned and executed for numerous clients at this fabulous venue…including an incredible courtyard wedding featured in Your Wedding Day, a national magazine! The courtyard wedding included an unbelievable transformation of the hotel into a quaint church ceremony followed by a romantic courtyard reception. It involved 600 candles; amazing lighting effects; a fountain (complete with pavers and moss); ironwork candelabras; olive branches; fresh flowers; and sugared fruit. The Citizen Hotel in downtown Sacramento has also been a perfect venue with its rustic brick and its black, grilled-framed windows that our brides adore. The hotel’s unique Metropolitan Terrace is a fabulous rooftop setting. 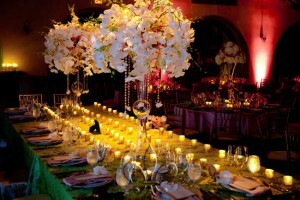 We are proud to have one of our Citizen Hotel weddings featured on The Wedding Chicks website. At the beautiful Tsakopoulos Library Galleria, we have created a feeling of amber romance for wedding receptions using candles and delicate lighting. With its panoramic views overlooking all of downtown Sacramento, we love creating small and intimate receptions on the 16th floor of the Holiday Inn on J Street. We’ve also held a wedding ceremony at the Hyatt’s Regency’s Capitol Room (overlooking the California State Capitol), which was followed by a tea ceremony. Nearby in Old Town Sacramento, the simple and elegant Firehouse Restaurant is a lovely venue with its candlelit fireplace mantel and outside courtyard. Just outside the city, fancy country clubs such as Catta Verdera Country Club in Lincoln, and Serrano Country Club, in El Dorado Hills, have proven to be excellent wedding/reception locations. Our “Vintage Rock meets Fashion Glam” wedding event was also featured on Platinum Weddings on WE TV…it was held at Serrano and unique elements included: special lighting of continuous rolling flames illuminating a grand oak tree on the 18th hole of the golf course; a chantilly pink, black, and white reception; an after party “Ed Hardy” themed lounge for the gentlemen; eccentric “Betsy Johnson” themed lounge for the ladies; and a surprise firework grand finale timed just perfect to a vintage rock song. We look forward to planning a fabulous Sacramento event with you! 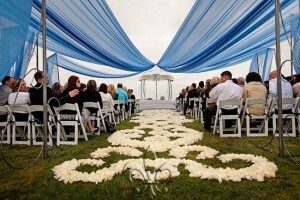 Please Click Here to view our Sacramento Wedding Portfolio.